Finally www.Boy-Kuripot.com ~ Philippine Freebies, Promos, Contests and MORE! Yahoo! I finally bought the www.Boy-Kuripot.com. For the longest time, I couldn't buy it because it was bought by someone else. Last year, I bought a .ph domain. Unfortunately, blogger had trouble using .ph which is why I wasn't able to use it. I'm just excited to share this news to all of you and at the same time I want to thank you for staying subscribed and sharing the posts. Please let me know if you see any errors, correction or problems concerning the change of domain. In the next month, I'm planning on 2 things. First is to create a mobile app that shows all the credit card promos I post here. That way, you can check what credit card to use depending on the amount of your receipt, the date and of course, the rewards, points or prizes you want. My 2nd project is catered to companies, agencies and bloggers who run promos and contests. I will be creating a guidelines of what a good promo and/or contest should be. 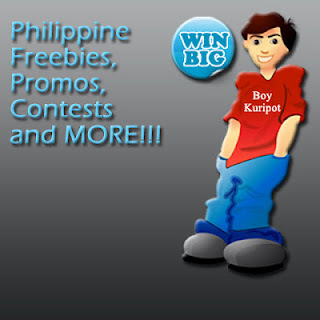 If the contest or promo adheres to those guidelines, I will be marking it as a Boy-Kuripot certified promo or contest. This way, you, the readers could easily identify if the promo or contest has clear and fair rules. What do you think? Let me know your thoughts and suggestions below. I'm also open to people who would want to help in any of these projects.